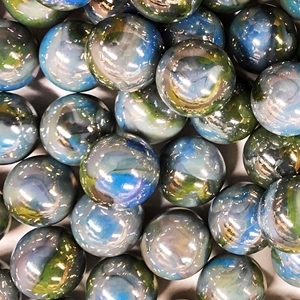 These Thunderbolt boulder marbles are opaque grey with swirls of sky blue and green on the surface. They are iridized to have an extra shiny reflective surface. They are approximately 1" in diameter. These boulders are sold in packs of 12. Sizes may vary slightly. Warning! : Choking Hazard. This toy is a marble. Not recommended for children under 5 years.